The acclaimed French writer Émile Édouard Charles Antoine Zola (1840 - 1902) was born in Paris, The City of Lights, in 1840. He is considered to be the most artful writer in the literary school of naturalism and was an accomplished novelist, playwright, and journalist. He was twice nominated for the Nobel Prize in Literature; in 1901 and again in 1902. We became the most widely-read writer in France after publishing Drink, featured in our Realism Study Guide. He was also a significant political figure, influential in "the political liberalization of France" and was a key player in the exoneration of Alfred Dreyfus, a falsely accused and convicted army officer. 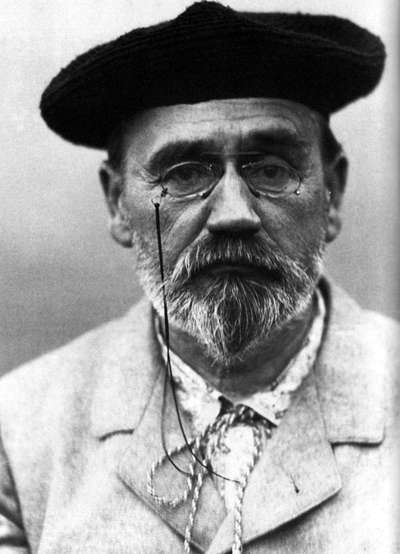 On January 13, 1898 Zola published an open letter, "J'accuse ...!" ["I accuse...! "], standing up to and accusing his government of Anti-semitism and and wrongful conviction. The letter stressed a lack of evidence as well as judicial errors. The government brought charges against Zola, finding him guilty of libel on February 23, 1898 and Zola fled to England to avoid prison. He did not return to France until June 1899.